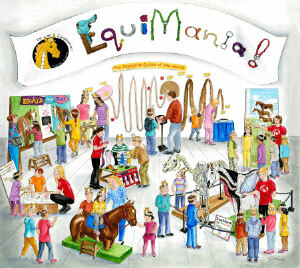 EquiMania! gallops back into Toronto for the third time this year for the Royal Agricultural Winter fair November 6-15! Equimaniacs can&apos;t get enough of the hands-on activities and love to immerse themselves in Equine Guelph&apos;s well-travelled, award-winning display. Equine Guelph partnered with the OEF will be promoting &apos;Ticket to Ride&apos; once again at the Royal Agricultural Winter Fair. The &apos;Ticket to Ride&apos; program was hugely popular at its launch last year at the Royal. It offers youth an opportunity for a FREE introductory riding lesson (or introduction to horses) at participating OEF member riding facilities. Visit EquiMania! and the &apos;Ticket to Ride&apos; booth for details. Girl Guide night is another feature returning on Wednesday evening November 11th. They will participate in an exciting itinerary of activities working towards earning their Horse Power Badge followed by a special presentation by OEF in the Animal Theatre. Horse owners everywhere comment, &apos;Where was this display when I was a kid?&apos; For the young and the young at heart, every visitor to EquiMania! will come away learning at least one new thing about horses. EquiMania! will also be home to one of the clues in the Mission: cultivation scavenger hunt being held by the Royal Winter Fair for school groups. Find the tree stumps at all 14 Education Centres and find the answer to an agricultural question. Let&apos;s see if we can stump you? When you are done bring back your booklet to the RESEARCH MATTERS booth near the aMAZEing Food Journey and enter to win a pizza party. Equine Guelph would like to thank the Royal Winter Fair for bringing EquiMania to their Education Centre and our sponsors for their continued support: Greenhawk, Kubota Canada, Ontario Equestrian Federation, Shur-Gain, SSG Gloves, System Fencing, Workplace Safety and Prevention Services and Zoetis, Equine Guelph is looking forward to another busy year of touring with EquiMania in 2016!